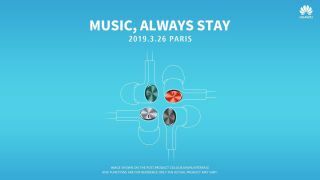 Huawei has teased that it will launch a new range of headphones at its launch event in Paris later today (March 26) alongside the P30 and P30 Pro. In a tweet from the official Huawei Mobile Twitter account, the company announced the name Huawei Freelace, along with today’s date and a picture of four sets of different-colored earphones with the slogan "Music, Always Stay", while the tweet includes the line "Sing a different tune". The image and words aren’t exactly cryptic – Huawei is clearly launching earphones, which will likely be linked to the handsets in the same way the Apple Airpods work best with an iPhone. What’s interesting is the emphasis on colors, with the earphones in the image different hues, and the word ‘colour’ in the tweet teasing that this is an important part of the reveal. Huawei launched the P20 and P20 Pro in a range of colors, and judging by a leak yesterday it plans to do the same with the P30 and P30 Pro, so we could see the Huawei Freelace launch in the red, green, silver and black color options shown. We’re not too sure what ‘Music, Always Stay’ is supposed to mean – it’s likely just a direct translation from Chinese that the company opted not to change, but in English it doesn’t make much sense. Huawei isn’t new to the headphones game, as in 2015 it launched the Huawei Talkband N1s, which had magnets in the buds so you could attach them together when not listening to music – in effect we found this just turned them into a hipster necklace, but it was a useful function for when you weren’t using them. The company also launched the Huawei Freebuds, true-wireless earphones, alongside the P20 last year. For up-to-date information on all the latest Huawei news and reveals from today’s press conference, check out our Huawei event live blog, which we’ll be updating with minute-by-minute news, analysis and hands-on first impressions.